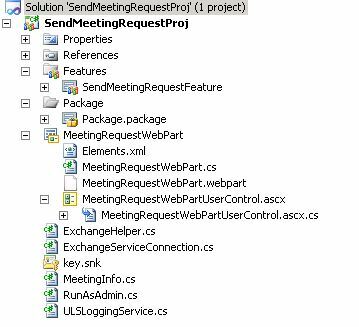 I have published more simple project for sending meeting request in codeplex. How to use Exchange Web Services (EWS) Managed Api in Sharepoint. How to use ElevetedPriviledges in Sharepoint Object Model. Recently I have faced with so many threads for sending meeting requests form Sharepoint .As you know there is not any out of the box feature that able to send real Meeting Request from Sharepoint. If you ask me , i agree with Microsoft on their perspective about it is not needed to add this feature as build-in and fallowing questions prove that implementation is a bit tricky and restricts flexibility of a global platform product like Sharepoint is not considerable. How much sense it makes to have a “global” solution sending meeting invitations by SharePoint? Does have each employee or user an Email/Exchange account and Outlook? What about versions , compatibility ? What are the possible benefits not using Outlook to send invitations and create meeting workspaces? How many people should create those meetings on the SharePoint platform? Are there also outside/foreign people who should create those meetings? Have a similar application like Outlook to use all sharepoint web services to do the job. So in many forums contains solutions and workarounds for solving this issue . One of them is using Workflow and sending request emails . Nice and simple one. In this article i am going to tell you more complex but more real solution for this issue. the key point is “Microsoft Exchange Web Services (EWS) Managed API 1.1 ” . the solution is using EWS in Sharepoint 2010 and sending real meeting requests from sharepoint. * Installing Exchange Web Services (EWS) Managed API 1.1 to Sharepoint servers. * A service Account for Exchange impersonation. 2) Add a new VisualWebPart named “MeetingRequestWebPart” . We use this web parts only for Meeting Workspaces . in this demo we can only able to manage meeting requests for specific Events which are related to a Sharepoint Meeting Workspace web site.Also you can change the design according your business needs. The webpart GUI is simple just contains 4 links and information label. 3) We need an account for impersonation.This account is resposible for connecting Exchange Server and manage operations like create,delete,update while impersonating less priviledged account means a user who can able to created an event. In my Example a have “Blog\MeetingService” account. Connect your Exchange 2010 server and Open the Exchange Management Shell. Before the begin to tell important part , we should add some AppSettings Keys to our webapplication’s web.config file. _service.Credentials = new NetworkCredential(UserName, Password, Domain); //and set our MeetingService account for credentials.we get the information from web.config file . _service.Url = new Uri(ExchangeServiceURL); //I am using here manuel service url . For getting information about AutoResolve options you should check “Useful Resources” section. Exhcange server need a certification configuration. In my test envoriment i havent any certificate so fallowing CallBack provides us bypass validation. // Validate the certificate and return true or false as appropriate. // all certificates should be trusted. For impersonation i have created a second constructor which getting a SPUser Prameter . //Add Attendees from Meeting Workspace Attendees List. The “MeetingInfo” class is a serializable data class that stores current meeting information like Meeting Title,Location ,EventDate,EndDate,OrganizerAccount etc. This class collects its data from 3 seperated data store 1) in Meeting Workspace “Meeting Series” List’s item data 2) related “Calendar” Event item data and 3) created Exchange AppointmentID and appointment created time.Why we are doing this or why we need another object to store all data ? Beacuse sharepoint objects are not able to serializable .You may need to keep changes and compare them .Also we have to store appointment object information which is created in Exchange Server for finding it when we need. //Geting currentMeeting object form “Meeting Series” list. //Creating a MeetingInfo object and filling it all needed information from currentMeeting object , related Event, ! !Appointment data will be add later. //Adding all attendees to newly created Appointment object from “Attendees” list which is defined in Meeting Workspace. if you don’t know your exhcange service url you can use powershell for getting url information easyly.